Messier 29 (M29) is an open cluster located in the constellation Cygnus, the Swan. The cluster has an apparent magnitude of 7.1. Messier 29 is too faint to be spotted by the naked eye, but can be seen in binoculars. It is best observed in telescopes at the lowest powers. 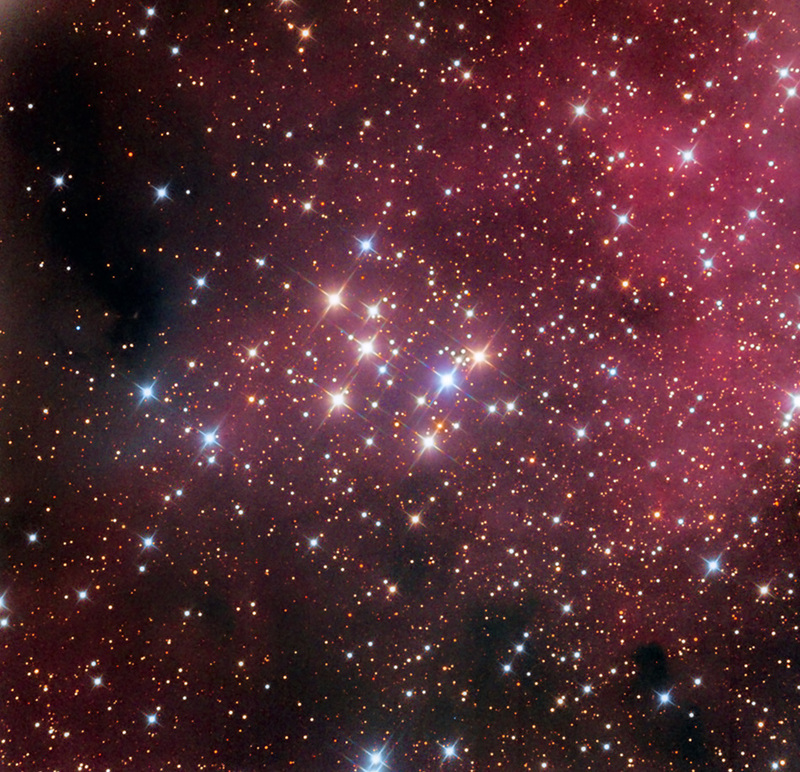 The cluster lies at an approximate distance of 4,000 light years from Earth. It has the designation NGC 6913 in the New General Catalogue. Messier 29 is located in the vicinity of the bright supergiant star Sadr, Gamma Cygni, which marks the intersection of the Northern Cross, a familiar asterism in the summer sky. 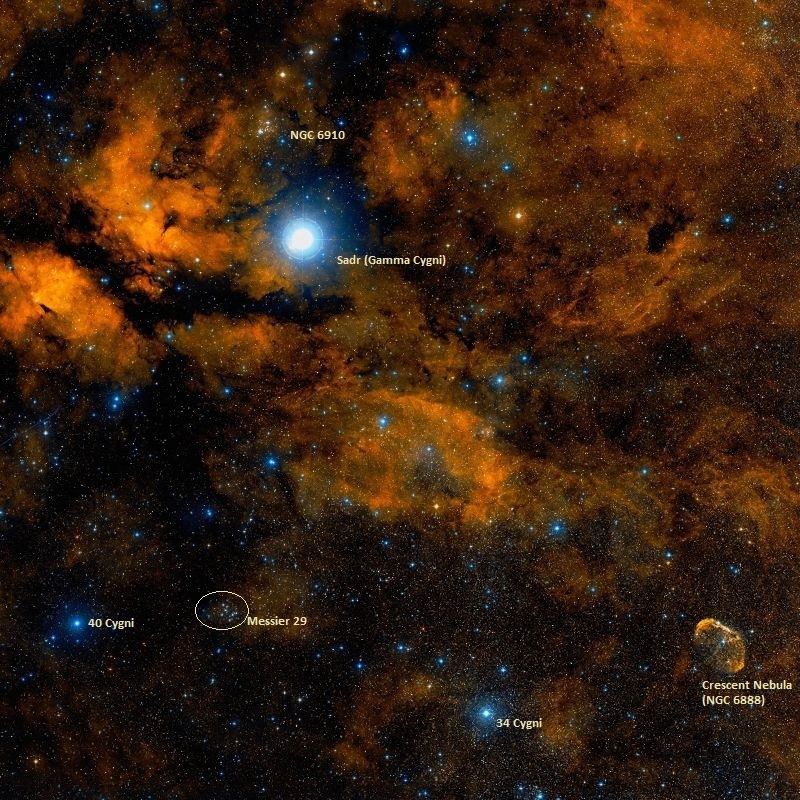 With a visual magnitude of 2.23, Sadr is the second brightest star in Cygnus, fainter only than Deneb. M29 can be found 1.7 degrees to the south and a little east of Sadr. It lies in a rich, crowded region of the Milky Way. Messier 29 is relatively small, occupying an area of 7 arc minutes in the sky, or a quarter the size of the full Moon. The cluster has a linear diameter of only 11 light years. It is classified as Trumpler class III, 3, p, n, which means that it is a detached cluster without noticeable concentration (III), it contains both bright and faint stars (3), it has fewer than 50 stars (p), and there is nebulosity associated with it (n). The nebulosity around the cluster can be seen in photographs. Messier 29 is approaching us at 28 km/s. The cluster is part of the Cygnus OB1 association, a group of stars that share a common motion, age and place of origin. The five hottest members of M29 are giant stars belonging to the spectral class B0, about 160,000 times more luminous than the Sun. 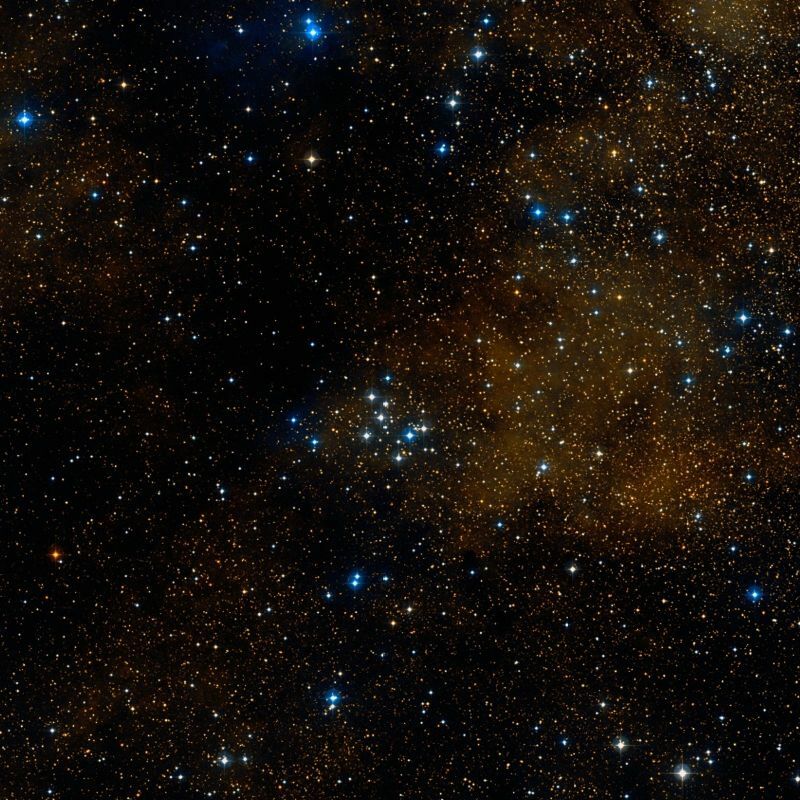 The estimated age of the cluster is 10 million years. There are six stars in M29 that are brighter than magnitude 9.5. The brightest one has a visual magnitude of 8.59. The cluster’s brightest stars form a quadrilateral and another three form a triangle, located just to the north of the quadrilateral, giving M29 the shape of a squashed dipper. This shape is visible in 3.1-inch telescopes. Without the dust of the Milky Way obscuring the cluster, the stars in M29 would appear about 1,000 times brighter. The cluster’s light is blocked by the material that was around when the stars were still forming. 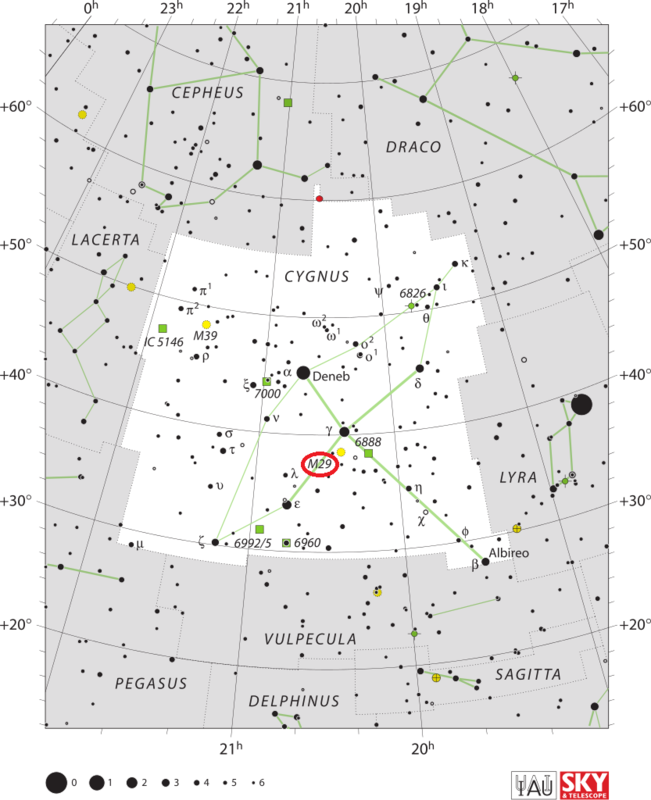 In the night of July 29 to 30, 1764, I have discovered a cluster of six or seven very small stars which are below Gamma Cygni, & which one sees with an ordinary [non-achromatic] refractor of 3 feet & a half [FL] in the form of a nebula. I have compared this cluster with the star Gamma, & I have determined its position in right ascension as 303d 54′ 29″, & its declination of 37d 11′ 57″ north. A neat but small cluster of stars at the root of the Swan‘s neck, and in the preceding branch of the Milky Way, not quite 2deg south of Gamma; and preceding 40 Cygni, a star of the 6th magnitude, by one degree just on the parallel. In the sp [south preceding, SW] portion are the two stars here estimated as double, of which A is 8, yellow; B 11, dusky. Messier discovered this in 1764; and though his description of it is very fair, his declination is very much out: worked up for my epoch it would be north 37d 26′ 15″. But one is only surprised that, with his confined methods and means, so much was accomplished.